The members of the 2014 CIF State Championship football team at Redlands East Valley High School received it’s rings this weekend. 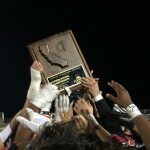 REV defeated Concord Clayton Valley Charter, 34-33, in the CIF State Bowl Game on Dec. 20 in the StubHub Center. 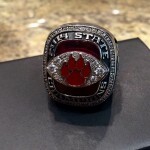 It was the first state football championship for the Wildcats. Redlands East Valley will play Clayton Valley on Saturday in the StubHub Center in the CIF State Finals. 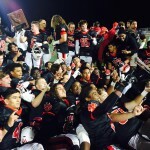 REV defeated Bakersfield Ridgeview, 59-42, in the CIF Division II State Regional game Dec. 13. 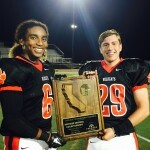 Clayton Valley defeated Oakdale, 28-7, to advance into the finals. Malik Lovette, above, talks after getting his Semper Fidelis All American Bowl jersey on Thursday. Kurt Bruich talks about REV being in the finals. He hasn’t tweeted about it himself, but Redlands East Valley High star wide receiver/running back Malik Lovette has apparently given a verbal to the University of Oregon. REV has not yet played a game this season. Lovette was an all-Sun selection last year after rushing for 445 yards and eight touchdowns and catching 47 passes for 770 yards and seven touchdowns. 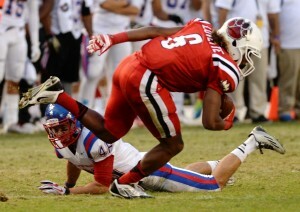 He is a four-star recruit according to rivals.com.